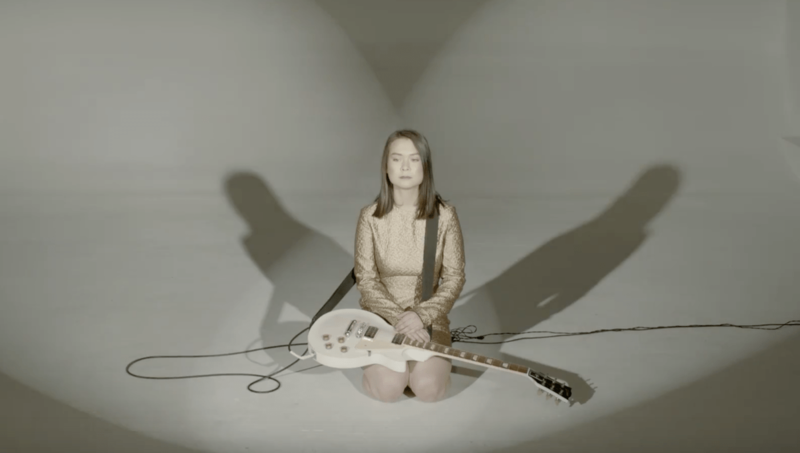 Mitski Miyawaki: 100% rock star. And rock stars aren’t going away. That’s not the present consensus. Nostalgic music fans often treat rock as if it’s on the ropes, or imperiled by inattention in the age of 140 characters, or the exclusive possession of an older generation that won’t share it with newer ones that wouldn’t understand its glories anyway. The Rock And Roll Hall Of Fame, that self-appointed bunch of prison guards, behaves like rock is a museum artifact, a relic of the Seventies, and little that happened after the C-86 is worth considering. Each December, articles get written in newspapers and major industry magazines about rock’s tumble from the pinnacle — this year, among other pieces, we had Billboard asking whether rock was still relevant (conclusion: not really.) Bill Flanagan, a critic and interviewer I’ve always respected, asked in the pages of the New York Times if rock was dead. He concluded that it was just geriatric; maybe a little addled, too. This handwringing has been happening forat least as long ago as the “Heart Of Rock And Roll”, which was a hit in, what, 1984? Don’t make me check. Huey, if you recall, reported that the old boy was barely breathing. All of this concern is testament to rock’s enduring value: if we didn’t like it so much, we wouldn’t be worried that it’s going away. Luckily, it isn’t; not even a little. The present fears about rock imperiled are largely caused by cultural fissures and nomenclature problems. Some personal prejudices, too, and maybe a collective failure of imagination. But all of that can be corrected, quickly, if we dispense with the arbitrary categories presented to us by industry marketing people, and take a look at music as it actually is. For instance, the best-selling musician on the planet is a pop-rock artist. Taylor Swift, as anybody who has ever seen her strike a pose and swing her red guitar around in concert can tell you, is 100% rock star. She may not play the sort of rock that Bill Flanagan, or David Fricke, or you, like best, but her connections to the classic writing traditions of the Seventies and early Eighties are impossible to miss. Her first four albums featured four-square pop-rock with folk flourishes; her fifth album was throwback new wave and dances with the white winged dove. In order to argue that Taylor Swift doesn’t rock, you’d also have to say that Fleetwood Mac and Carole King don’t rock, either. And of course they do. Why don’t we recognize this? Well, Taylor Swift was initially marketed as a country artist. Never mind that some purists in Nashville saw her as a wealthy Pennsylvania carpetbagger — she rose to massive fame on the country circuit first, and then ate the rest of the world for dessert. Rather than an industry classification for salespeople, country is usually discussed as if it’s a distinct musical style. But almost all of the music presently sold by Nashville is rock, plain and simple, and it’s borderline insulting to its antecedents that we ever pretend that it’s anything else. In 2016, the “country” designation has more to do with the American political divide than it does with anything the musicians are doing; a mainstream country show is just a rock concert where you’re liable to see somebody with a Confederate battle flag. Its purported opposite (although they’re actually two sides of the same U.S. mint, but that’s another essay) is not rock but hip-hop — the music of the cities, ethnic and racial minorities, and their sympathizers. The occasional pedal steel and banjo heard on Nashville albums are sonic signifiers meant to align the record with a certain folk tradition rooted in American soil. That drummer, though? — chances are, he’s playing a rock beat. Lately, artists marketed to the country audience aren’t even bothering to uphold the masquerade. Consider Maren Morris: Texan, alleged country singer, Best New Artist Grammy nominee, and 100% rock star. Hero, her album, consists of cheap-thrills arena rock (and I mean that as a compliment) sung in a bombastic style that sails far closer to Rihanna than Loretta Lynn. Gone are the folk instruments and any pretense to rustic authenticity; instead, the music is burnished to the same reflective, skyscraper-window sheen that coats all the other contemporary chart-busters. Again, this might not be the kind of rock you like. But in order to argue that Maren Morris doesn’t rock, you’d also have to say that Heart and Pat Benatar don’t rock, either. And of course they do. That rock resonates better in the countryside than it does in the city is something that a student of the style ought to expect. Members of the country audience drive more motor vehicles. Rock was born alongside the mass-marketed automobile and the Eisenhower Interstate system, and it’s still mixed and arranged for the highway. Some hip-hop is made for automobiles — especially the syrupy Southern stuff — but lots of rap records are designed to be heard on headphones and marketed to pedestrians and subway riders. Our feelings about the car have shifted around since 1955, but it remains central to American culture and the American ideal, and rock songwriters have, from the beginning, treated the vehicle and the road as both subject and metaphor. The theoretical building blocks for rock music have always been cars and sexual frustration, with one often substituting for the other — and as ambitious as rock lyricists have gotten, none of the greats have ever forgotten the basics. We’ve seen Chuck Berry fiddling, irate and inflamed, with the seatbelt in “No Particular Place To Go”, “Fire” Springsteen driving in his car with the girl who says no, Joe Strummer groveling before the womanin the brand new Cadillac, repressed Gary Numan and Lennon with the starlet and Prince and a pocket full of used condoms in the little red corvette and etcetera, all rolled up by the dashboard light into a big horny, greasy, automotive mess, and ain’t that America. Swift and Morris pick right up where their forerunners left off. The key songs on Hero are all about her ride and the men who can’t satisfy her. The central metaphor on 1989 was the car wreck (“hit the breaks too soon/twenty stitches in the hospital room”): the crash as a symbol of desire out of the control of its possessor. Nearly everybody in a Nashville song seems to be on a dirt road in a pick-up truck with a girl or boy who will or won’t; knock the operators of the music machine for predictability if you must be ungrateful, but never claim that they don’t grasp the rudiments. This extends to the few mainstream country artists who do occasionally generate the kind of honky tonk music that Hank Williams might have found familiar. Foremost among them is Miranda Lambert, who, not unjustifiably, calls herself the Keeper of the Flame. But despite such throwbacks as “To Learn Her”, Miranda Lambert is 100% rock star, an old-fashioned traveling bandleader who opens and closes her highway-crazed double album in her car, and who writes nail-chomping stories of desires unfulfilled. Women in rock express sexual frustration differently from the way the boys do; it’s more “dreaming of the day that you wake up and find/what you’re looking for has been here the whole time” than”get your rocks off get your rocks off”. But the urge is exactly the same, and in order to argue that Miranda Lambert doesn’t rock, you’d also have to say that Creedence and Bonnie Raitt don’t rock, either. And of course they do. Rock persists because it works: it expresses basic desires for release and personal expression in the urgent, loud sound and direct language that is specific to the American experience. Many other styles have been tried out by pop musicians, but they fall short. The only major form of popular music that is both distinct from rock and aesthetically satisfying is hip-hop — and hip-hop borrows plenty from rock. Hip-hop succeeds on its own merits not merely because it has developed its own sound and its own history. It also has its own symbology, and its own ideological inspirations: telecommunications, connectivity, and social mobility. That said, the hip-hop enterprise has modeled itself on the rock biz, right down to the emphasis on the frontman and his loyal beatmaker, the single as handshake-hello and the classic album as the unit of enduring value, the spectacle concert as the main public interface, and the star’s assumption of godlike powers. Many pop bestsellers draw equally from rock and hip-hop: Lemonade, for instance, is split right down the middle between guitar-n-drums numbers and others that rely on synths and digital beats. That doesn’t make Beyonce one hundred per cent rock star. But in order to argue that she never rocks, you’d also have to say that Tina Turner and Donnie Hathaway (and Tori Amos) never rocked, either. And of course they did. Here’s what strikes me funny about that stereotype, though: in the long history of rock music, there haven’t been many times when the style was dominated by ruffian white-boy groups. More often, rockers were shooting-star solo artists like Elvis or Little Richard, or large ensemble funkmasters like Prince and Sly Stone, or blatant art school kids on a spree like Talking Heads or Genesis, or machine-tinkerers like Eno or New Order. There will always be a vocal segment among fans of popular music who will not accept that an artist is a rocker unless he — and it is always a he — sounds and behaves like G.G. Allin. But even in the Eighties, G.G. Allin was never much of an attraction beyond his niche. An oppressive world like ours allows for a million and one ways to rebel, and rockers haven’t begun to exhaust the possibilities. This story has many chapters to go, and it’s on us to make sure we’re telling it right — and never to deny club membership to the many who are, plain as day!, carrying on tradition. Even if they don’t look, or act, like Keith Richards. C’mon, rock writers, admit the club is much bigger than you say it is. You’ll feel better with the gates open. There’s nothing wrong here that a little ventilation can’t fix.